The Liberal Bee Jays broke through Friday night. 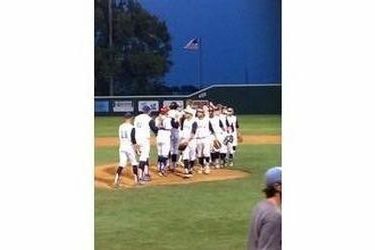 The Bee Jays banged 15 hits and two home runs in an 11-5 win over the Jayhawk South leading Haysville Aviators at Brent Gould Field. The wind finally changed directions Friday and blew out which seems to fit this BJ team well. After the Aviators scored in the third, the Bee Jays scored three in the fourth, five in the fifth, and three in the sixth. Chase Chambers and Nick Brooks hit home runs and drove home three runs a piece and Brent Williams laced two doubles and drove home three runs. Grant Glaze pitched six strong innings for the win. He struck out five and did not issue a walk. Liberal is 22-14 overall and 18-12 in the Jayhawk League. Haysville is 16-10 in the Jayhawk. The same two teams meet Saturday night at 7 at Brent Gould Field with the Dugout Show at 6:45 on 1270 and kscbnews.net. Golden Plains Credit Union is the buyout sponsor.